Staring at a box of ruby red cargo from the good folks over at ZZ2 Farms over the weekend, we were spoiled for choice when it came to super fresh speciality tomatoes. Packed inside were mini plum Romanitas (so crispy and sweet), slightly larger Bacios (lusciously ripe and red on the vine) and the big brother of the family, Rigolettos (just bursting with flavour and also on the vine). There in front of us was an assortment of red gems so fresh and juicy, just waiting for us to sink our teeth into; somewhat figuratively, but thankfully a whole lot more literally by the end of it. But what would be the most fitting tribute to what ZZ2 have nicknamed their ‘Tasty/Saucy/Juicy Little Rascals’? We could hardly wait to unpack the box, with thoughts and ideas swirling around and endless possibilities waiting to be chopped, blended, roasted, preserved, fried or even stewed. The tomatoes are so sweet and fresh, and so versatile too, that they can be used in so many wonderful ways. You could skip the formalities really and just eat them straight out of the packet. Or turn them into squidgy, squishy tomato toasts; or wild salads; or slice them up with cheese and basil; or stuff them with a bit of Danish you-know-what; or transform them into pasta sauces to oven-dried beauties. The list is truly endless. In the end, we decided to show them off in three deliciously different ways. First up: a ham nest, filled with a whole egg and chopped Bacios, roasted in a muffin tin in the oven. This is a pretty snazzy all-in-one breakfast or brunch, quick to have on the run, take on a picnic or even done on the braai. It can be spiced up with some paprika or chilli if you want to add some kick. The final result is a great handheld treat. Next, we decided to do a spicy roast tomato sushi using the Romanitas. We love veggie sushi rolls and felt the sweet depth of the roasted tomato together with a slice of avocado would be a filling combo made in heaven. We aren’t sushi experts by any means so ours don’t look perfect but they’re perfectly heavenly to eat! The Romanitas were slow roasted with peri-peri powder and a light drizzle of balsamic vinegar, adding a tanginess and richness, drawing out the true flavour of these not-so-little rascals. 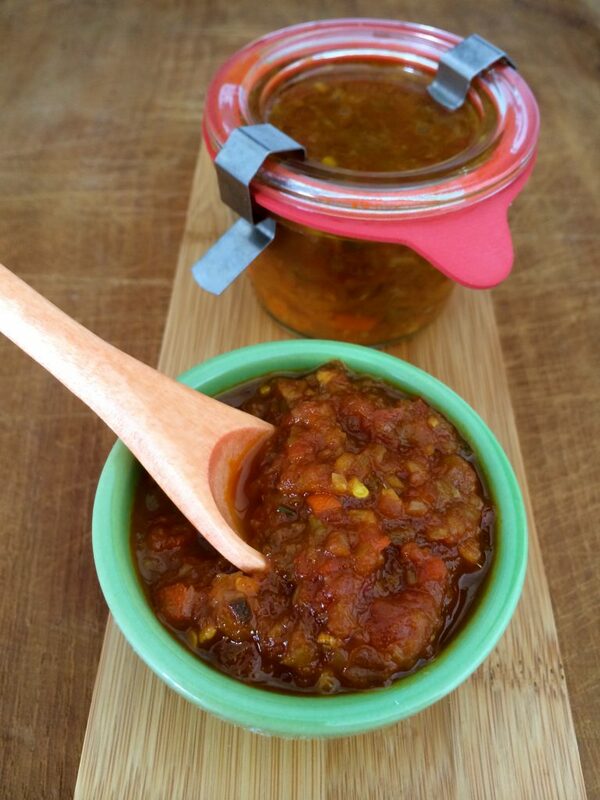 Last on the menu, but in no fathomable way least, we decided to use the Rigolettos to make a kasundi – a rich, unctuous, sweet, sour, spicy tomato relish of Indian origin. There are many variations of this recipe, mostly using mustard seeds, but we decided we wanted the tomato to be the predominant taste. So we blitzed the rascals with spring onions, garlic, oil, vinegar, chillies and spices, before simmering the mix over a low heat for an hour until it thickened just enough. This relish is absolutely marvellous and once you’ve tasted your first batch, you’ll never be without it in your fridge. It can be used on sandwiches, with chicken or meat, with cheese, as a blob on top of a baked potato with sour cream, or as a way to splurge on your Huevos Rancheros – instead of the usual chilli sauce, spread the kasundi under the chicken skin before roasting. You won’t be short of excuses to use up every last drop. These are just some of the ways you could use these beautiful love apples, but continue the fun by getting your hands on your own box of little red guys and trying your own ideas. And if you come up with something unique and interesting, enter ZZ2’s recipe competition on their Facebook page to win a brand new casserole dish.